In the dead of winter, frigid days and dark nights often become arduous. As the season trudges forward, finding comfort amidst the chill and keeping an upbeat spirit requires intention. The satisfying warmth of a hearty bowl of soup is the perfect panacea. If you’re feeling adventurous, you could go international and make pho, which is a specialty in Vietnam. 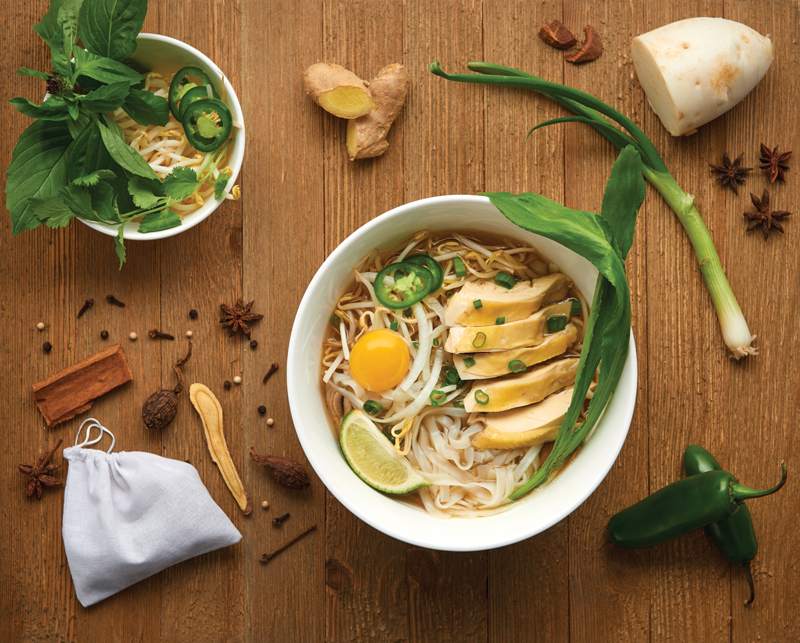 Phở Gà (or homemade chicken pho) is made with a complex broth, a “walking chicken” and thick rice noodles dressed in Thai basil, cilantro, jalapeño, scallion, lime and an egg yolk. Pho is something I have always longed to make firsthand, but understanding and navigating its complexity is a bit of an undertaking. So, I sought the help of a dear friend, John Nguyen, who first introduced me to pho more than a decade ago. His wife’s aunt is locally known for her pho broth. I’ve learned a great deal from John over the years, particularly about food. One day while debating sushi or pho for lunch, we completely jumped the tracks and decided to make chicken pho. His resolution in maintaining quality was amplified by my ambitions for the visually stunning. John insisted on using a stewing hen, and procuring one proved to be difficult. We spent a Saturday afternoon sourcing pho ingredients at three local Asian markets, an experience itself worth mentioning. Each is a small oasis of remarkable foods many may find unfamiliar. That discovery is a humbling, wonderful process of culinary and cultural enlightenment. After extensive searching failed to yield a stewing hen, we scored a beautiful yellow free-range chicken or gà đi bộ, literally translated as “walking chicken,” at Viet My Oriental Food Market. From there, we set off to make the chicken stock. 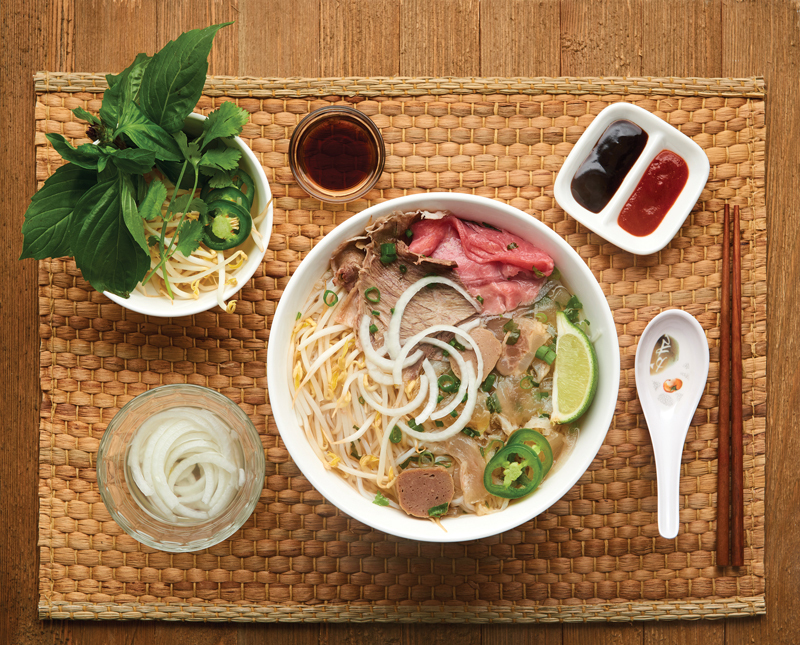 A steaming bowl of pho is one of the most satisfying winter foods you’ll ever taste. On a cold day, it will warm you from the inside, and if you’re not perspiring just a little from the temperature or the optional seasonings, something is plausibly wrong. While recipes and styles of pho vary throughout Vietnam, the broth is undeniably the most crucial ingredient. Making just the broth for this delightful Vietnamese rice noodle soup takes anywhere from two to four hours for chicken pho, and eight to 24 hours for beef pho. 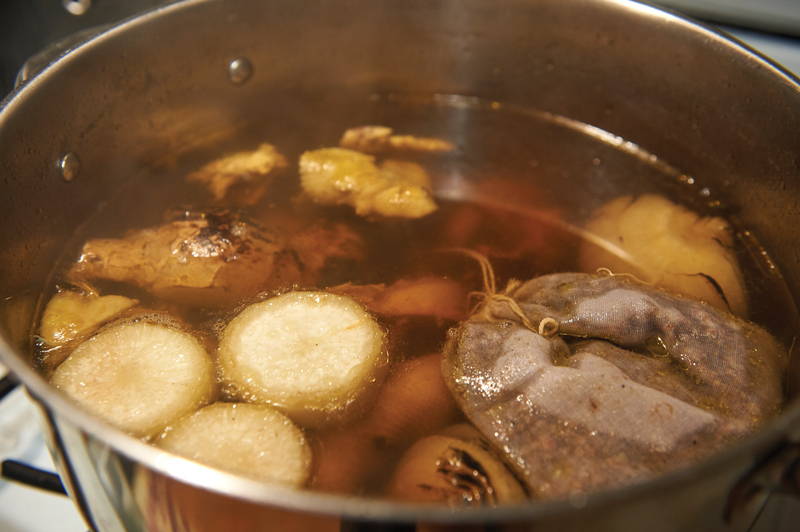 A well-made broth is full of dynamic flavors, which is foundational to the overall appeal. Depending on the recipe, a sip of the broth unveils layers of earthy, licorice notes from star anise, as well as the distinctive taste sensations of clove, peppercorn, coriander seeds, cinnamon and fennel. Yellow rock sugar raises the level of sweetness while adding radishes, charred onions and ginger builds the profile of the stock. 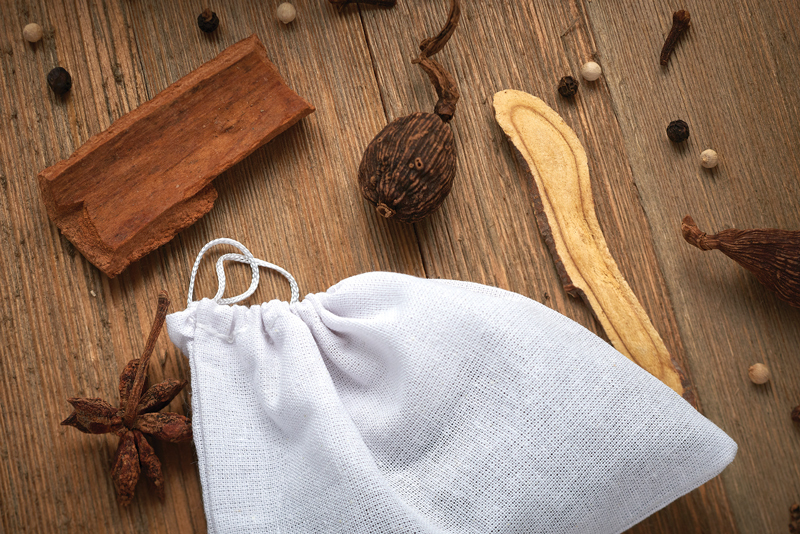 Gia vị nấu phở Bac, or pho spices, seasons the broth in a cloth pouch packed with the flavors of star anise, fennel, cardamom, coriander seeds, black peppercorns, cloves and cassia bark (Chinese cinnamon). Your choice of meat determines the broth base, and there’s much to choose from even between beef and chicken. 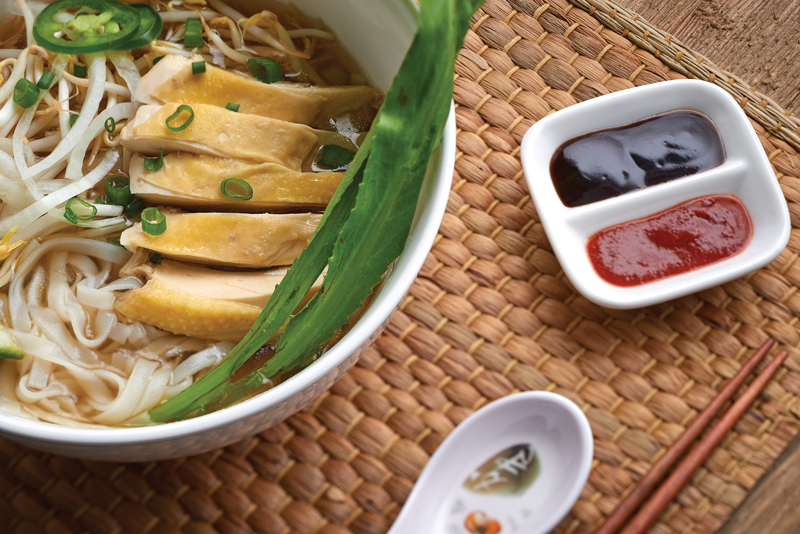 In chicken pho, while more common in homemade recipes, stewing hens cook remarkably better than younger chickens, thus delivering more flavor to the broth. The tougher meat is perfected over a slow cook in a similar manner to a pot roast over low heat. A well-made chicken broth, with its robust, mouth-watering flavor, will put any traditional chicken noodle soup to absolute shame. Beef broth leads to a selection of juicy options, the “safest” being meatballs and beef brisket. For the more adventurous, rare roast beef, beef tendon (which can be crunchy or soft), and beef tripe are among the options. Personally, I love the first two, but I can live without tripe. If you’re apprehensive, stick with what you know to start. Phở Gà, chicken pho with hoisin sauce and sriracha on the side. Pho is a personal experience, one to be relished, and it satisfies more than hunger. As dynamic as a good broth is, the collective bowl is customizable to individual tastes. An assortment of fresh accouterments on the side includes fragrant Thai basil, crunchy bean sprouts, warm jalapeño and bright cilantro. Adding sweet and salty hoisin sauce with spicy sriracha on the side for dipping meat and tangy lime juice squeezed into the bowl all expand the experience. Beef pho, as made by Sai Gòn Café in Lancaster, whose pho broth alone takes more than 24 hours to prepare. Sides include Thai basil, bean sprouts, jalapeño, lime, cilantro, pickled onions, fish sauce, hoisin sauce and sriracha. True to Vietnamese culture, optional fish sauce and pickled onions add even more savory and sour notes. Bursting with glutamate, adding an intact raw egg yolk to steaming hot broth is a savory umami bomb waiting to explode. Flavors meld and textures change from the first spoonful to the last, with crispy bean sprouts softening as they cook and rare roast beef warming up. It’s a full-course meal in a bowl that will leave you satisfied but not overfull, free of greasy or dense elements. Those unfamiliar with pho may argue there’s too much going on, but the depth is akin to that of a symphony: every ingredient brings something crucial and necessary. Learning how each component plays off the other is part of the fun, and from there, the way forward is yours to dish out. 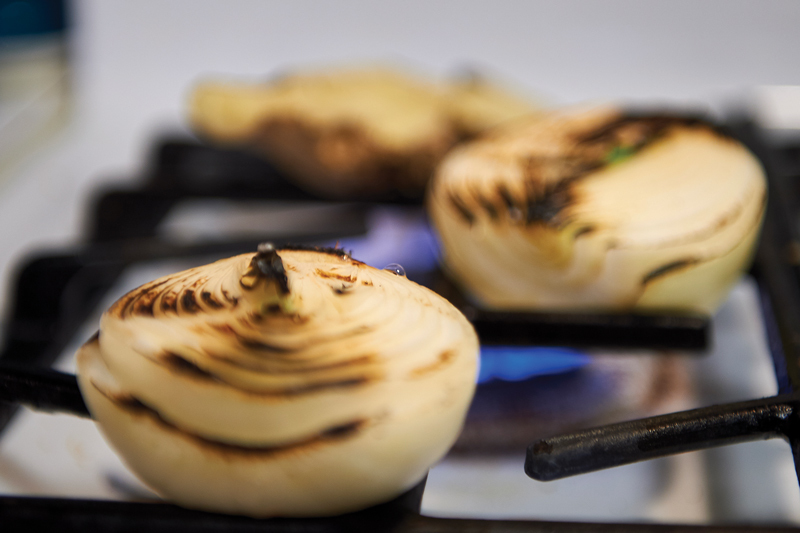 Yellow onions char on a gas range for the broth, adding layers of flavor and a darker color. For those already familiar with pho but looking for another option on the menu, Bún bò Huế is for you. This soup, which consists of a spicy broth made from pork and beef, traces its roots to Central Vietnam and receives its style and namesake from the city of Huế. Bún bò Huê, as made by Sai Gòn Café. 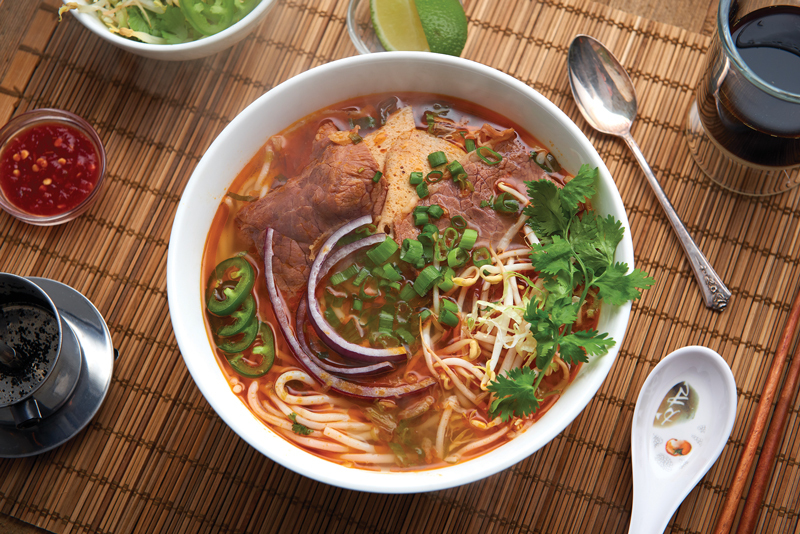 The rich and spicy beef and pork soup is served with chili garlic sauce, a bowl of mixed shredded lettuce, bean sprouts, cilantro, red onion, jalapeño and sliced limes. Hot Café du Monde Coffee and Chicory is served over condensed milk using a metal phin. Bún bò uses round vermicelli rice noodles and is laden with notes of bright lemongrass. Chili garlic sauce replaces sriracha, with shredded lettuce, mint, banana flower, red onions, jalapeño and lime on the side. The broth itself is cloudier than pho and presents a strikingly deep red in color. Traditionally, Bún bò Huế is served with ham hock and congealed pig blood, similar to tofu meets blood sausage. The pairing might be a bit much for some folks but compliments the rich broth made of often expensive oxtail and marrow bones. It can also be made using seafood, something not associated with pho. While at the markets, I decided we needed a roasted duck for a late lunch, and John suggested warm pork bao buns as a snack. He also made salted tangerine-lime soda using seltzer water, salty pickled plums and sugar, served on ice. Vietnamese food plays with sweet and savory in such a beautiful way. The day ended with the most memorable chicken pho I will ever experience. Fresh rice noodles took a quick bath in hot water before building the bowl. The texture of the chicken was lean and tender, made better dipped in fish sauce, and the broth was everything we hoped it would be. The egg yolk came after the chicken and was the most unexpected delight of the bowl itself. Such a shared experience ties further emotion to cooking and serves as a heartfelt reminder that food can equate to happiness. The care invested in cooking both reveals and speaks to a person’s (or restaurant’s) philosophies in regard to patience, attention to quality, knowing when to hold reverence to tradition, and understanding when to walk away from it in a world where food culture is alive. In this case, traditional ingredients might seem unfamiliar, but if you think about it, nearly all of our cuisine sprouted from seeds grown elsewhere. Satisfaction comes not in a can, but in a bowl of fresh ingredients from a part of the world where shortcuts simply won’t do. In Vietnamese culture, eating soup for breakfast is commonplace, leaving me to conclude that “now” is always the right time to enjoy a gratifying bowl of pho to warm the stomach and soul. • Pho Noodle House | 252 N. Prince St.
• Pho Pasteur 3 | 2204 Columbia Ave.
• Café & Pho Hoang | 1140 Elizabeth Ave.
• Noodle King | 216 N. Duke St.
• Sprout Rice & Noodles | 58 N. Prince St.
• Issei Noodle | 44 N. Queen St.